You don’t have to go far from shore this time of year to catch your dinner! 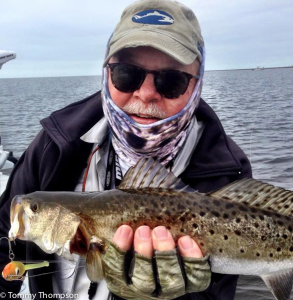 After somewhat of a “fish drought” in late 2014, Big Bend fishing for spotted seatrout and redfish has picked up significantly since New Year’s Day 2015. I’m not sure exactly why, possibly due to some sunny days and cooler water temperatures, but there seem to be plenty of fish being caught from Yankeetown to Panacea, along the Natural North Florida Gulf coastline. 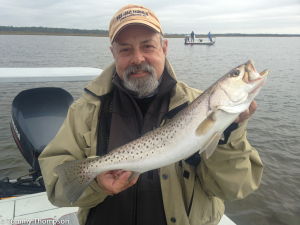 And it’s not only in the “usual” wintertime spots that fish are showing up. Lots of slot-sized (15-inches and up) trout are on the grass flats, eager to eat live shrimp or artificial baits rigged under corks. 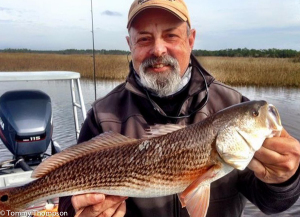 And redfish are schooling up over rocky and shell bars along creek mouths and river estuaries. Reds are a bit more finicky eaters than trout, and you may have to be more patient, but some nice ones, at the top of the 27-inch slot are showing up on local dinner tables. Redfish are hungry, too. But they can be more scattered than trout. Look for rocky bars near shore and mullet jumping!